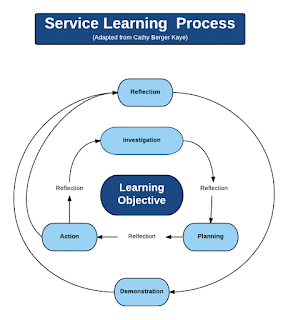 Typically high-functioning service learning projects take place in a local context, allowing them to be on-going and develop relationships between both 'parties'. In the context of short term experiential learning trips - such as Inspire and Week Without Walls - current evidence would suggest that special attention has to be paid to the needs of the community so that the benefit of the visitors does not happen at the detriment of the perceived beneficiary community. So you might expect that conversations regarding how to make WWW or Inspire trips most closely focus on an authentic local need and provide ongoing benefits to a community when we are gone just a few day after we arrive are somewhat complicated. But when there is a common understanding, and a supporting will, we can get pretty close. 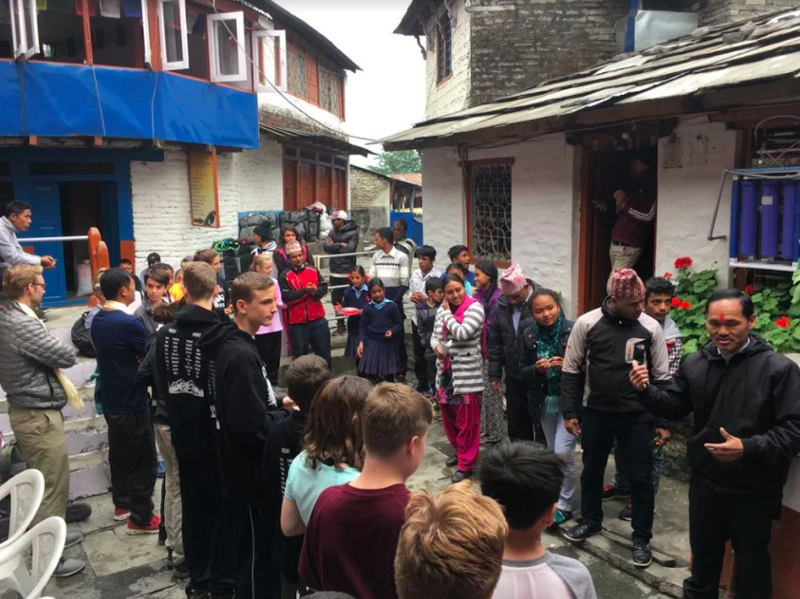 The grade 7 hiking trip to Nepal was deemed last year to be "limited" in terms of the community benefit from our presence there. Time was spent trying to investigate the situation while on the hike and one issue that came up was that of plastic water bottles. Conversations with our travel partner, Mountain Quests, indicated that there might be willingness to pilot a filtration system for water. We spoke with Matt Farr of Mountain Quests (who is "on board" in terms of how our program might affect the local community on the ground) and determined that purchasing a water filtration system for one of the local guest houses there would be a good start to, hopefully, re-directing the current use of water bottles. The students did background investigation on the problems associated with plastic waste. Last year's students also indicated a need for keeping the trails clear of plastic bottles (which they collected). This gave rise to the creation of The Annapurna Tea House Filtered Water Project. On the ground students engaged with the owner of the guest house - the only one who had agreed to try out the new situation. 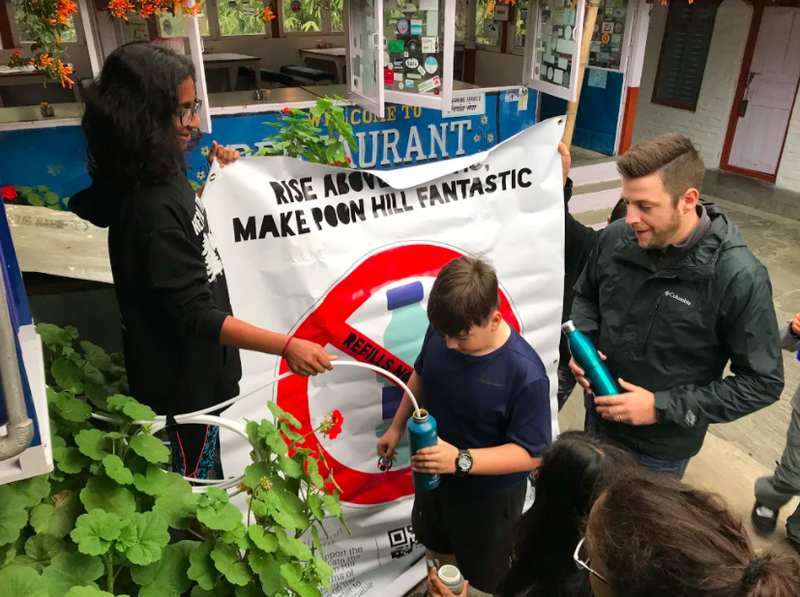 It didn't take long for our students to help the owner see the economic benefits of selling filtered water from source rather than having to purchase water bottles for resale. But the added benefit that popped up was that he would no longer need to find a way to discard the bottles either. Previously he would have to have either moved them long distances or, more likely, burn them (with the pollution that creates). 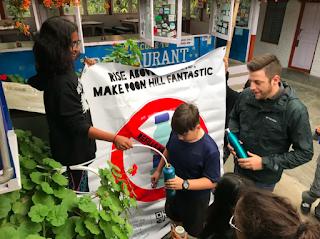 The students also engaged the local school which was already focusing on trying to address the problems of water bottles. The school had been doing awareness campaigns but little evidence of success. But not ASD and the local school will partake in mutual data collection and analysis as well as generating reports to be shared with the guest house owner on how much waste has been avoided and how much economic benefit it has resulted in. 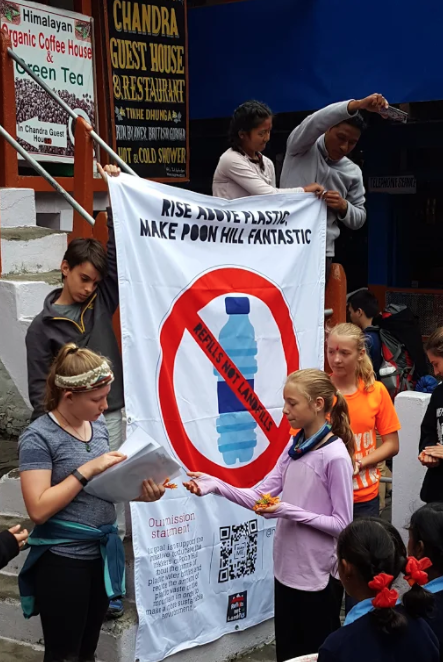 It is no doubt that this is much more "service learning" like than walking down a path picking up water bottles and taking them to the next guest house to keep the place beautiful and to continue to attract more hikers. 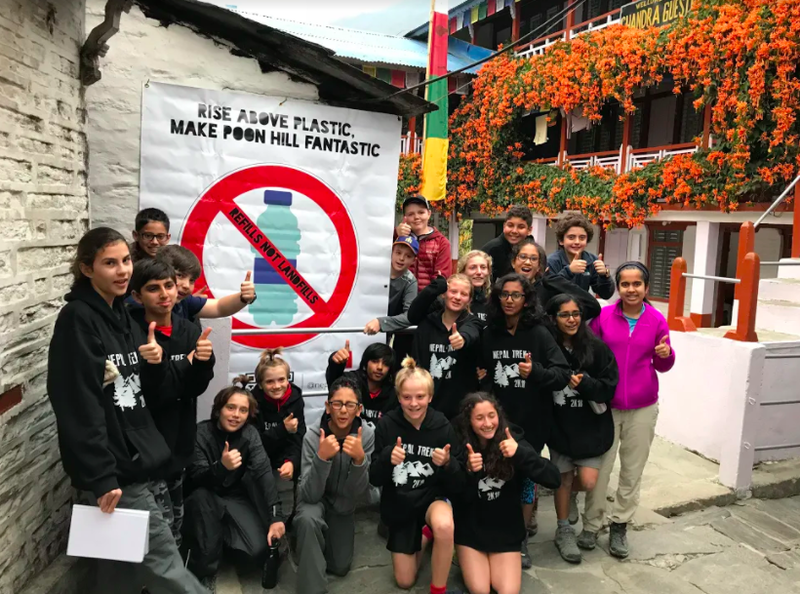 We are hoping that this program will not just generate data over time (next year's Nepal Hike will also be gathering data) but will hopefully prompt other guest houses to move away from water bottles and invest in filtration systems. We can only hope that, over time, ASD and Mountain Quests will have been involved in reducing the plastic waste impact on the Himalayan hiking trails, have supported the local school in doing so and have allowed the health of the locals to benefit from the absence of toxic fumes. Though this post serves as a bit of a demonstration for the learning and the process the true demonstration will be shared by the students at the WWW celebration night. 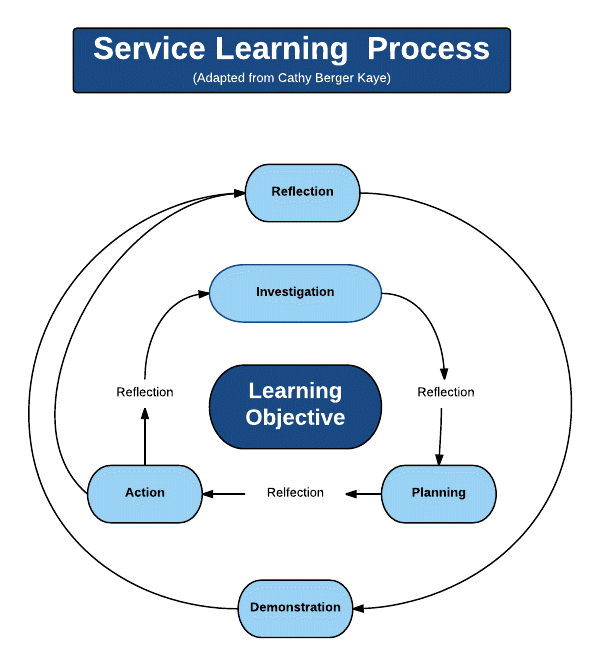 More that that, however, we hope this will also serve as an "exemplar" for what can be done when we merge service experiences with an authentic, ongoing learning experience!